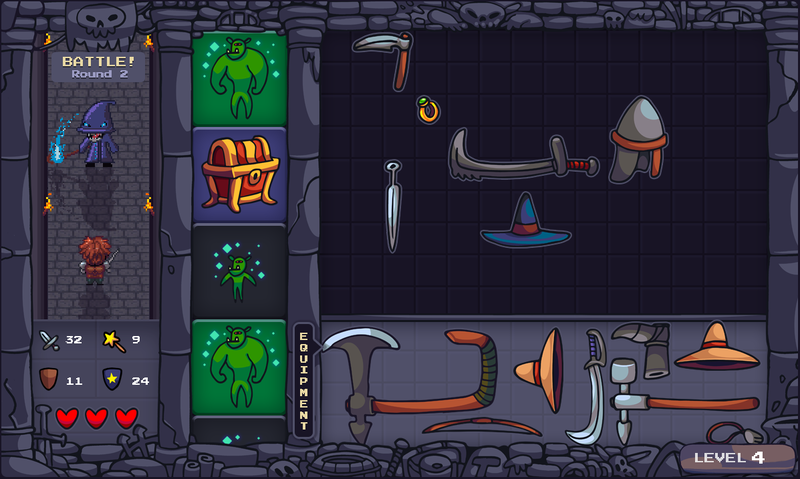 Inventory management simulator gone roguelike! This game is a part of Ludum Dare game jam. Rate it here! Are you one of those damn hoarders? Do you loot every single house on your way - as long, of course, as their owners don't see your dirty hands touching the cutlery? Well, this game is for you! But this time, you don't have unlimited inventory space. 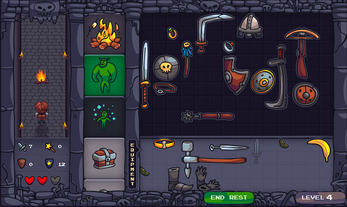 Try to fit all your crooked swords, magic shields and useless food items in the little space you have - all that in a randomized dungeon, with enemies out to get you! 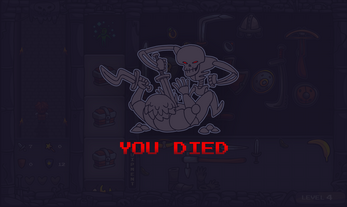 What's going to cause you the most trouble - a legendary skeleton mage or your beloved items? Game made in a team of 3 for Ludum Dare 42 Game Jam. Build info: Download 1.1 for newest version. If you find the game too hard, there's an installer of original version available - it's much easier! 1. Download .dmg file and mount it. 2. Drag the Loot Keeper game icon to the Applications folder. 3. Go to Applications, right click on Loot Keeper app and select Open. Absolutely love every aspect of this. Any way we can get a making of video or picture article? I find that kind of stuff fascinating. I read you nurfed rings to prevent min maxers but I think your missing the algorithm you should be using for item gen. I would also offer bonuses for bigger more difficult items because they are harder to slot together in a coherent order in the equipment slots. Was fun playing, i'll keep going tomorrow see how far it goes, I hope it's not an endless one. I have a need to check every item to make sure i'm not missing stuff! now you can floor them or ceiling or just round them, whatever you thinks best. Thank you for that very detailed piece of feedback. That's a really good idea and the right direction to sort that issue out. Yes, definetly item spawning needs to have better math behind it. 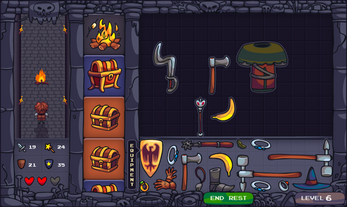 We are planing to add item rarity system too so we will need to think how to incorporate that. But your calculation will be a great start to work on this. Thanks again. This game truly fits the "not enough room" theme for this LD. I think we're all guilty of hoarding items, especially in games like Skyrim and Fallout, and I think if inventorywas managed like this, we'd be a little better at choosing the best equipment. Love the fact you can see what's up next; it's a great way to determine whether or not moving items is essential that round. I absolutely loved your game and thought it was awesome. I am a writer for a small website that covers everything gaming. I am adding the game to an article that I am currently writing and will post the link to the article here when it had published. In the meantime here is a video of gameplay I did. I hope you all continue on your journey of making games. Updated (Sept 3, 2018) Here is the article that the game is included in. Hiya! I played your game on my channel! I really liked this game, it was a nice nad fun game to play! I thought this was a great take on a timeless classic. 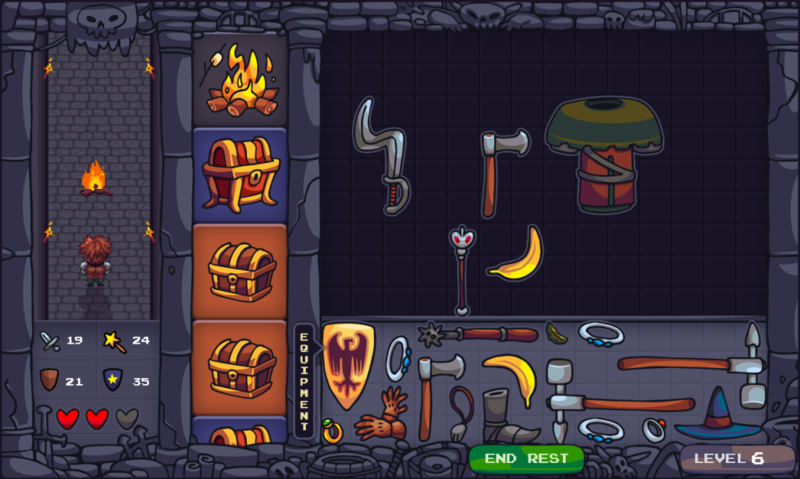 I enjoyed how the inventory looked like Diablo. Really nothing bad I can say about this tons of fun! I haven't downloaded this game or read anything at all about it, I hardly even glanced at the first screenshot on the page. All I wanted to say was how genuinely perplexed, baffled, and disgusted I was by the fact that the L was a sword and not the T.
I just scrolled up to look at some of the screenshots, and realized what this game was really about, meaning that the bent sword was very intentional. However, I spend a good 15 seconds of my precious time writing the paragraph above, so I will still post this comment. Although, now, as I finish this paragraph, I realize how it would have been easier to not post the comment than to add an explanation paragraph afterwards that was twice as long. Hey ! i played you game for a couple of hours today. i have some feedback and even some ideas. I loved the game, it looks awesome and really easy to get into. The game itself got a bit grindy quickly. i had the original game from the installer. so i quickly found out that rings are OP. 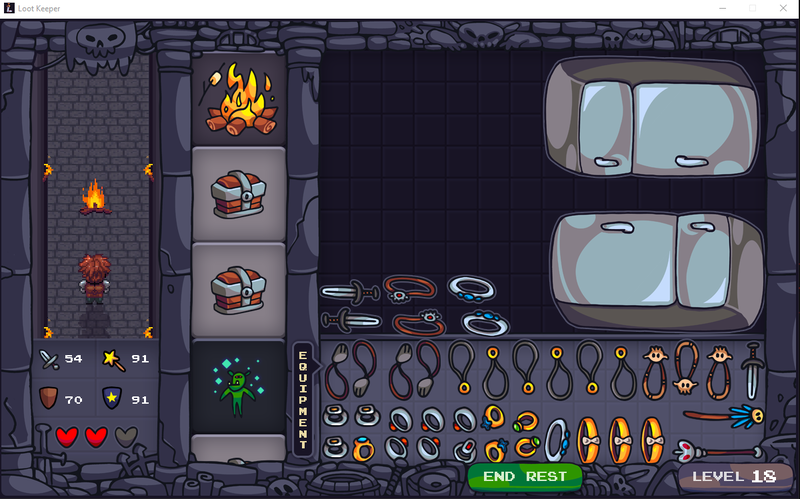 There's no need to keep any loot, i kept two fridges in my inventory for 23 levels and my equipment was just rings. the game crashed before i could screenshot it but i will do another run to show how i travel trough the levels. -add a currency in the game. every time you fight an enemy, you get some coins. 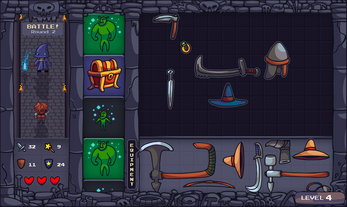 -add a merchant where you can sell the loot you get. i see the pics up here and i just go.. why do they keep all that stuff, just destroy it. it's worthless. -the choice to be a girl because let's face it, girls are way cooler AND cuter. 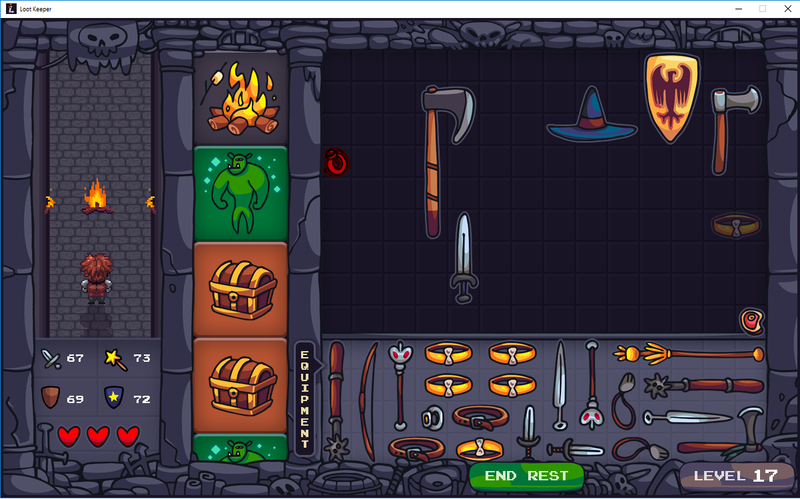 -( not sure yet about this one but i'll leave it to you) possibility to find keys on enemies to open certain chests. I couldn't play any longer, need some sleep. This time, the first boyo rekt me even tho i had everything equiped you get at the start. did you know fridges use up 27 spaces, not 28? this run i had the idea you don't need physical damage output. I like my inv clean. and i also love playing tetris. - merchant event - big items are worth the most and the most expensive items you can buy are small ones! - trap events - where you need to "hide" certain type of items either in your backpack or in your pockets, or else you will receive damage. Imagine a bear who attacks you if he feels any food on you! And now I'm totally adding your ideas to the list, especially with boss fights - I imagine bosses that spawn stuff in your inventory but you have to be smart and use it against them! Thank you so much for playing and recording our game! The way progression works right now is enemies get more and more difficult with every camp, while your items stay the same - so at some point, there's no way to beat them, the only question is how long will that last :) We tried to make it happen faster with the last patch while also not making it impossible for players who got bad rolls on items at first. In full version, we'll make sure to balance it better! Are there plans for Linux/Web builds? Great game. I think this game would be even more great on smartphones. Hello! I loved the game, but I cant find a link to the LD page to give a rating! You can add a link to it by editing the game page, there should be a field just for that. Great game! Lots of fun to play. Only critique is that after a while you can become invincible and the in-game enemies lose their (quite literal) magic. This was great! Gave a review on LD, and will mention it here, but the movement speed on the selected item was a bit fast. Other than that, everything was great!